"This land...it changes a person," he said slowly. "It's changed me. I'm not the same person I was when I left Boston. I'm not sure God recognizes me now." "This land doesn't change you," she said softly. "It just makes you more of who you are." Sarah Prescott and Justin Wells meet in unlikely circumstances. 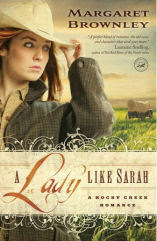 She's an outlaw who's been captured by a lawman and is being transported back to Texas to be hanged. He's a minister moving from Boston to Rocky Creek Texas to take a new post. Despite their many differences, Justin and Sarah cannot deny a strong attraction growing between them. As they end up traveling together, they come across a group just attacked by Indians with only a small baby surviving. Justin and Sarah take baby Elizabeth into their care, thus creating a stronger bond between them. But Sarah is wanted dead. And Justin is loathe to see this happen. Can he find a way to save her? This book was a complete and utter surprise to me. I was surprised by just how much I liked it. I loved both Justin and Sarah, they were both likeable characters but flawed in ways that made them seem human and real. The romantic and sexual tension was tastefully written, but still, you know, tension. The circumstances of the time period were written in such an interesting way, the Indians were never demonized, and the hardship of life in the West was portrayed. This is a Christian fiction romance novel so both Justin and Sarah had spiritual issues they were dealing with alongside their romantic issues, and I loved this part of the book as well. They never came across as perfect with put upon flaws (like so many Christian fiction characters) but rather honest and real people simply trying to figure out what it meant to both believe in a loving God and share that love with others. While the book is fairly heavy on this, it never felt preachy it seemed grounded in the journeys of the characters. And it was funny! I found myself grinning several times. The pacing is perfect, the romance melts your heart, the characters are loveable...quite simply to me it was the perfect Christian romance novel! I've been hesitant to read this one because I am not that attracted to books with cowboys/cowgirls in them (or on the cover), but you make this one sound really good. And I didn't realize that this was a historical, either--I thought it was contemporary. I'm going to go put it on my wishlist now. :) Nice review! Juju I hope you get a chance to read it! Katy--I think that's why I'm surprised I liked it so much, I was not a fan of the cover. I'm really glad I took a chance on it though, b/c it's a great book! This sounds really good and I've added it to my wish list. Great review!